Japan's Prime Minister Shinzo Abe, who is also ruling Liberal Democratic Party leader, shakes hands with his supporters after an election campaign rally in Fukushima, Japan, October 10, 2017. TOKYO - Japanese Prime Minister Shinzo Abe’s ruling coalition is on track for a big win in Sunday’s general election - even though almost half the country’s voters don’t want him to keep his job, a media survey showed on Monday. Abe’s Liberal Democratic Party (LDP) is set to win between 281 to 303 seats in the 465-member lower house, while its junior coalition partner the Komeito is on track to take 30-33 seats, the Mainichi newspaper said, based on an Oct. 13-15 survey. That would put the ruling bloc on track to maintain the two-third’s “super majority” it held before the chamber was dissolved for the snap election. That means Abe’s grip on his post is all but assured when parliament convenes to elect a premier after Sunday’s poll. The Mainichi survey, however, showed 47 percent of voters would prefer not to see Abe stay in his post. Abe took office nearly five years ago promising to bolster defense and boost growth with his “Abenomics” strategy. 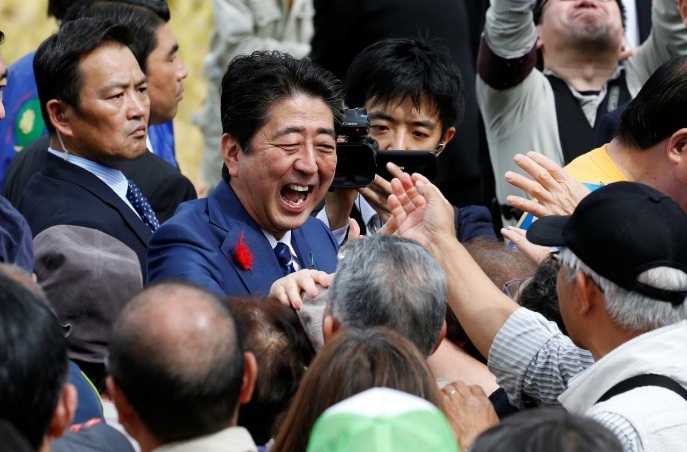 “Abe is not popular, but his party is trusted by enough voters to win big if only because the new parties are untested and have not generated excitement,” said Jeffrey Kingston, director of Asian studies at Temple University Japan. An electoral system where 289 seats are from single-member districts where the candidate with a plurality of votes wins and others get no representation at all also means a split opposition benefits Abe’s LDP. The rest of the chamber’s seats are from proportional representation blocs. Koike’s fledgling Party of Hope, which the former LDP lawmaker launched last month as a “reformist, conservative” alternative to the LDP, is likely to win between 42-54 seats. The party’s platform also shares much of Abe’s hawkish security agenda, but differs by promising to freeze a planned sales tax hike and to exit nuclear power by 2030. The CDPJ “crept up from nowhere,” Kingston said. “It is clear there are a lot of people who feel left by the wayside by Abenomics.” The Mainichi forecasts were based on responses from 73,087 voters nationwide. Japanese Prime Minister Shinzo Abe’s ruling coalition is on track for a big win in Sunday’s general election - even though almost half the country’s voters don’t want him to keep his job, a media survey showed on Monday.